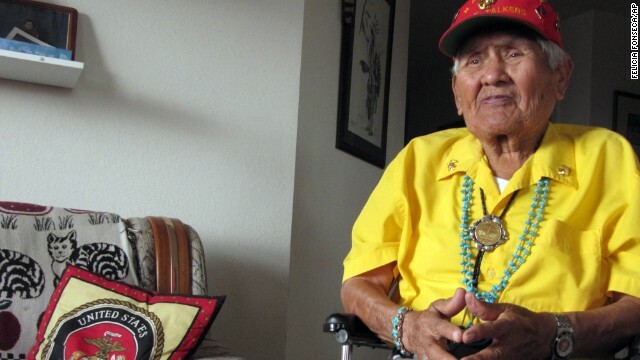 Chester Nez was silent for years about his role as one of the original Navajo code talkers. Donald Sterling agrees to sell the LA Clippers. A shooter is on the run after killing three cops in Canada. And the Bowe Bergdahl fallout continues. Fallout continues: Senate members watched a "Proof of Life" video of Bowe Bergdahl yesterday. But it did nothing to convince some that swapping five Taliban terror detainees for the captured Army sergeant was the right thing to do. "For two days now, we've asked questions, many of which have not yet been fully answered," said Sen. Marco Rubio, a Republican from Florida. Shooter on the run: A Canadian town is on lockdown after a gunman killed three police officers. "Shooter still believed to be in Pinehurst Subdivision area of Moncton. Stay locked inside. Leave outdoor lights on," authorities said this morning. Motorists are urged to stay away from the town in New Brunswick province. Almost a done deal: After initially indicating he'd fight a sale of his team, Donald Sterling seems ready to move on. His lawyers say he will sell the Los Angeles Clippers to former Microsoft CEO Steve Ballmer. Price tag: a record $2 billion. Internal report: If you drive a General Motors car, keep reading. The car company will release its findings today on an investigation of an ignition switch defect. About 2.6 million cars were recalled worldwide for the flawed ignition tied to at least 13 deaths. End of an era: For decades, Chester Nez kept silent about his role as one of the original Navajo code talkers who developed an unbreakable code during World War II. He died yesterday at 93, the end of an era for the armed forces. Swoon. Or not: It starts off with a romantic song for his girlfriend. Then it takes on a different tune. Inspired by baby: Dancers imitate a toddler, and the results will make you smile. Help me ... I'm falling! Let's just say this wedding party will remember this moment forever. Reverse fun: Dominoes falling is a pretty cool visual. Now reverse that falling - and the awesome factor goes way up. What a nice morning surprise! I am so glad Team CNN listened to our comments! Awe, thank you so much, Sharon. We can't take the credit, though. We passed this along to the New Day digital producers, and they were the ones to add back the videos. We're always happy to help, so please do say hello to us on Twitter @TeamCNN or on Facebook at CNN.com. And of course, we help with New Day! Thank you for giving me back my morning enjoyment. I was starting to have serious withdrawal symptoms. My morning is now complete! Thank you so much for bringing my morning pick me up back. I concur, very happy to have the extras back. Thank you for taking user comments into suggestion. YAY !! My day is complete. Thank you for bringing them back! Glad you're enjoying the videos. Thank you for bringing back the extras!